Windows 10 has been out for a while now and I eventually got a machine running it: the 4 cores machine I have used so far. So I was in a position to try out .Net Native as it seems, disappointingly enough, to be only supported for so-called universal applications on Windows 10. .Net Native uses the same optimization stages as the native C++ compiler, so one would expect to get (in some cases) the same performance level. Note that in the context of these memory benchmarks, I wouldn’t be expecting much improvements as in most cases we are memory bandwidth limited. The most obvious exception being the sequential reads, as we already know, can be executed faster with vector instructions (15 GB/s versus 11 GB/s on the 4 cores machine). Having said that, I might try the concurrent random reads case of my Addendum primum. I haven’t updated the code which needs various changes to compile on the universal platform. The code as it stands now in Github sums the values in the array and then discards the result. This, obviously, won’t go down very well with a good optimizing compiler, which will just avoid carrying out the calculation. Actually the impact wasn’t always quite as drastic, but still better safe than sorry. 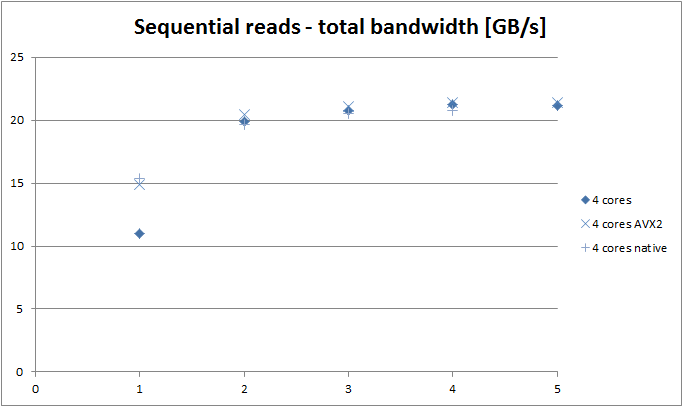 So here is the latest greatest chart for sequential access on the four cores machine using .Net Native: As expected, or hoped for, .Net Native gives similar performance to C++ or AVX2.